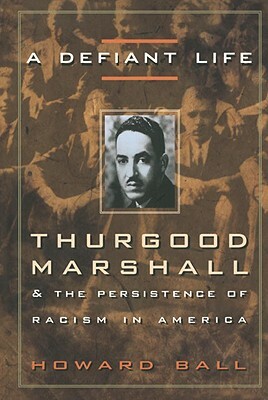 Thurgood Marshall's extraordinary contribution to civil rights and overcoming racism is more topical than ever, as the national debate on race and the overturning of affirmative action policies make headlines nationwide. Howard Ball, author of eighteen books on the Supreme Court and the federal judiciary, has done copious research for this incisive biography to present an authoritative portrait of Marshall the jurist. Born to a middle-class black family in "Jim Crow" Baltimore at the turn of the century, Marshall's race informed his worldview from an early age. He was rejected by the University of Maryland Law School because of the color of his skin. He then attended Howard University's Law School, where his racial consciousness was awakened by the brilliant lawyer and activist Charlie Houston. Marshall suddenly knew what he wanted to be: a civil rights lawyer, one of Houston's "social engineers." As the chief attorney for the NAACP, he developed the strategy for the legal challenge to racial discrimination. His soaring achievements and his lasting impact on the nation's legal system--as the NAACP's advocate, as a federal appeals court judge, as President Lyndon Johnson's solicitor general, and finally as the first African American Supreme Court Justice--are symbolized by Brown v. Board of Education, the landmark case that ended legal segregation in public schools. Using race as the defining theme, Ball spotlights Marshall's genius in working within the legal system to further his lifelong commitment to racial equality. With the help of numerous, previously unpublished sources, Ball presents a lucid account of Marshall's illustrious career and his historic impact on American civil rights. Howard Ball, professor of political science and University Scholar at the University of Vermont, is a leading expert on the U.S. Supreme Court. He is the author of eighteen previous books and dozens of articles in leading political science journals and law reviews. He lives in Richmond, Vermont, with his wife, Carol, their dogs, Max and Casey, and a quarterhorse named Stormin' Norman. Their three daughters, Melissa, Sheryl, and Sue, visit on occasion.